For once, I am writing an entry that isn't about me, but it is about my friends. We entered Activity 2 of The Doll Wardrobe's ongoing photo contest. As the theme was "Holiday/Celebration," we opted to showcase a birthday - more specifically Maura's birthday, which took place on January 15. 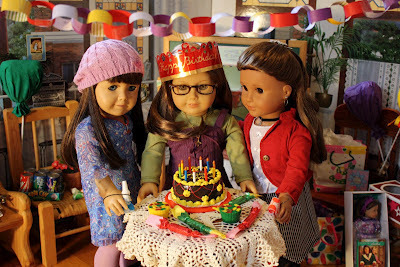 "We decided to showcase a winter birthday celebration as we get awfully tired of American Girl only recognizing spring birthdays. For her 14th birthday on January 15, Maura decided on a small party in the local ice cream parlor. Her two closest friends sang 'Happy Birthday' as she pondered what exactly to wish for. "What about a new American Girl doll?" she thought, before realizing that that wish had already come true (see her new Ruthie doll in the bottom right corner?). "Oh, wait, I know what to wish for!" Maura thought excitedly. She made her wish and blew out her multi-colored candles one by one. What do you think she wished for? If I tell you, it might not come true! Anyway, a fun time was had by all three girls, and they are now anticipating the next birthday to celebrate." Maura and I would be much obliged if you voted for us! See all of the entries, including ours, HERE (and, yes, you can vote for multiple entries!). Send an email with your votes to nora.demington@gmail.com by February 19th. I love that picture! It really speaks "celebration". I love the colors and the setting. I will be happy to add my vote!